High level efforts are underway to find ways to substantially ramp up production of experimental Ebola vaccines and drugs, officials at the World Health Organization and within the U.S. government say. The talks involve trying to find more production capacity for the therapeutics, which before this outbreak had never been tested in people. On the table is a plan to try to devise a tweaked version of the antibody cocktail known as ZMapp, so that the drug — currently produced in tobacco plants — could be made in other production systems for which global capacity is greater. The goal is to significantly increase the supplies of several promising products that are in the early stages of development but which are currently available in minuscule amounts — or, in the case of ZMapp, not available at all. An official at the U.S. Department of Health and Human Services, who spoke on condition he not be named, said that by the first quarter of next year it`s hoped that more manufacturing facilities can be harnessed to generate a multifold increase in output. “It’s not (currently) at commercial scale. That’s the problem. All of the vaccines, all of the therapeutics are at early development and just coming out of pilot scale,” he told The Canadian Press. People working on this effort stress that large amounts of any of the experimental vaccines or drugs are not within reach in the near term. But the West African Ebola outbreak, the largest in history, is not expected to be contained any time soon. Even if the work succeeds, there will not be vaccine for broad use in affected countries for the foreseeable future. But there may be sufficient supplies to stop the spread of Ebola into previously unaffected areas using a technique known as ring vaccination — protecting people in contact with a new case to stop or slow the spread of the disease. “This is a very realistic picture. But we are rushing against time. We are rushing against time,” said Dr. Marie-Paule Kieny, the WHO’s point person on the project to develop, test and distribute the experimental products. This work is coming together at what is an extraordinary speed in the world of drug development and licensure. But it is still heartbreakingly slow in real-world terms, given the scale of the outbreak and its potential to spiral even further out of control. Last week Liberia, the worst hit of the three main countries enmeshed in the outbreak, said Ebola was threatening its national existence. “The deadly Ebola virus has caused a disruption of the normal functioning of our state,” Defence Minister Brownie Samukai told the UN Security Council. The WHO said Friday that there had been at least 4,784 Ebola cases and 2,400 deaths so far in this outbreak. The total case numbers are more than 10 times higher than the largest previous outbreak. In fact, before this epidemic fewer than 3,000 people in total were known to have been infected with Ebola in the disease’s nearly 40-year history. Even if drugs and vaccines could be rolled out widely right now, thousands more people would be infected and killed before the outbreak could be contained. And in reality it will be months or longer before significant amounts of these therapeutics will be available — if they prove safe for human use. Only after they are rolled out will it start to become clear whether vaccines and drugs that protect primates from Ebola will do the same for people. There are two Ebola vaccines being fast-tracked through this effort. One was designed by scientists at the U.S. National Institutes of Health, and has been licenced to pharma giant GlaxoSmithKline, now known as GSK. The first human trial of this vaccine began earlier this month. Kieny has said initial safety data from this trial could be available in November; if all goes well, limited supplies of the vaccine could start to be used after that. The second vaccine — identified by many scientists as the more promising of the two — was developed by scientists at Canada’s National Microbiology Laboratory in Winnipeg. It goes by the working name VSV-EBOV. The Canadian federal government, which owns the intellectual property, has licensed it to NewLink Genetics. A small biotech company in Ames, Iowa, NewLink has been swept into the maelstrom that is one of the most urgent searches for effective therapeutics in modern times. The company is being offered assistance to help it get the vaccine through initial human safety trials and into production. “They have committed to scale up” production, Kieny said. The hope is to vastly increase capacity to produce the vaccines. “We’re trying to optimize the production of both of these vaccines, scale it up multifold — multi-multifold,” the HHS official said. Negotiations are underway now between HHS officials, the vaccine licence holders and other companies that have manufacturing capacity that could be used to produce the vaccines. The Public Health Agency of Canada is also party to the talks. 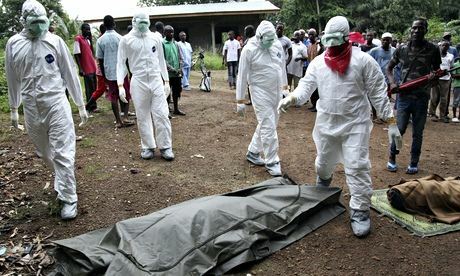 “The Agency is in regular contact with the licencees of the ZMapp treatment and the VSV vaccine as well as with multiple international partners, including the WHO and HHS, to provide guidance and advice on ways to facilitate the production of Ebola therapeutics,” the agency said in an emailed response to questions. Work too is underway to see if other companies that produce drugs in tobacco plants can be brought into the ZMapp effort. One of the companies in the discussions is Medicago Inc., a Canadian company with U.S. operations that is developing vaccines produced in tobacco plants. “We think there are several that can help us with the production of the ZMapp monoclonal antibodies using the system that they have for expressing and manufacturing and purifying these products,” the HHS official said. But the capacity for plant-based production of the promising product is not enormous. So the search has expanded to see if companies that make drugs in other cell-systems can also be used. Some drugs and vaccines are produced in insect cells, others are generated using what are called CHO cells — cell lines from Chinese hamster ovaries. Most commercially produced monoclonal antibodies are generated in CHO cells; the HHS official said there is “huge, huge” CHO cell manufacturing capacity available around the world. But there is a hitch: One of the antibodies in ZMapp does not perform as well when it is grown in CHO cells. A study published in 2012, in fact, revealed that the protective power of the antibody was two-fold greater when it was produced in tobacco plants than when it was produced in CHO cells. ZMapp is a cocktail of three monoclonal antibodies, meaning each targets a specific target on the Ebola virus. Two of the antibodies were produced at the Winnipeg lab. The third was developed at USAMRIID — the U.S. Army Medical Research Institute of Infectious Diseases in Frederick, Md. Both facilities had each earlier developed cocktails of three monoclonal antibodies. Researchers at the Winnipeg lab later took the six antibodies and tested all the various combinations to come up with the best of the best, which has become known as ZMapp. That team and others are working to see if alternate combinations of antibodies — ones which perform better if produced in CHO cells — can be developed. “So it’s similar to the ZMapp product, but not identical,” the HHS official said. He said people from the best companies that make monoclonal antibodies have been brought into the talks to help find ways to successfully scale up development. What are the 10 possible cures and vaccines for Ebola? Could blood, serum of Ebola survivors help patients? Posted on 15th September 2014 by newsafrica. This entry was posted in Africa, Ebola, Health, Human Development and tagged Ebola, Ebola virus disease, GlaxoSmithKline, Liberia, Medicago Inc, Public Health Agency of Canada, World Health Organization, ZMapp. Bookmark the permalink.